The Force Awakens got everything just right. It introduced new, charismatic characters while allowing the established favorites to shine. It utilized an action-packed pace while jumping from location to location to location as it revealed a plot that tickled our fancy in all the right — albeit familiar — ways. It gave us spaceship chases involving, well, our favorite spaceships, lightsaber duels, witty banter, and real emotional stakes. It focused on old relationships rekindling, new relationships bonding, and teased future relationships to come. Best of all? It set the scene for major revelations. What would Luke Skywalker’s role be in this story? Who are Rey’s parents? Is Kylo Ren as evil as he would like us to believe? Will Poe and Finn be the best new duo in Star Wars lore? Will Captain Phasma have a defining moment? How do Leia and Chewbacca move on after Han Solo’s death? And just who is this Supreme Leader Snoke? At the end of The Force Awakens, I not only felt extremely satisfied, but genuinely excited to discover all of these things with the next installment. The Last Jedi starts off with a bang, but then just kind of fizzles and fizzles and then disappears. 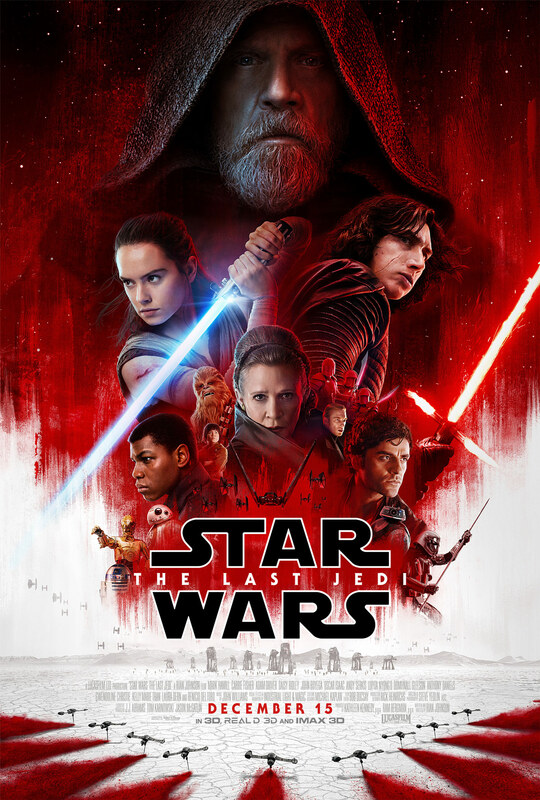 I actually found myself a little bored for quite a bit of this movie, which is something I thought I would NEVER say about a Star Wars film. There’s so much talking. Soooo much talking. But nothing is really ever happening — nothing that felt substantial, at least. And when something monumental did seem to be happening, it quickly turned out to be nothing. It fizzled, like I said. The Last Jedi would raise out hopes time and time again only to laugh in our face and run away. It got a bit offensive, honestly. Perhaps the greatest offense of all? It did not get me excited at all for the next episode. Just the opposite. Again, I won’t get into specifics in this space, but The Last Jedi seemed intent to crush every cool thing The Force Awakens teased while leaving us with nothing to replace our anticipation. The Force Awakens had me counting down the days until the next installment. The Last Jedi left me ambivalent and, frankly, disappointed. Kylo Ren – Is he good or evil? Is he a plant by the Resistance? Is that why he had such difficulty killing his father? Is that how he got overpowered by a novice, the great new hope of the Resistance? Yeah, he’s evil. Or, at least, that’s what they tell us. Because, you know, they mostly tell us stuff in this movie. I really don’t buy him as this supremely evil person. Worst of all? He wore his mask for maybe five minutes. Kylo Ren with the mask and voice? Awesome. Could watch him all day. Kylo Ren without the mask? No thanks. Adam Driver’s face does not scream the kind of evil they would like us to believe. Exactly the opposite. Leia – Spent most of her time talking. They showed us an amazing display of the Force. Then she fell into a coma. Then she talked some more. Then she faded into the background. Finn – Virtually no interaction with Poe or Rey, which, I think, were the crowning moments of The Force Awakens. No background revelations. He’s honestly not in the movie much at all. On a mission to accomplish a goal that seemed forced. No longer the fish out of water trying to make good. Just kind of there. Captain Phasma – Showed up for about three minutes near the end of the movie. Fell down a hole. On the plus side, we learned one of her eyes is blue. Yes, that’s sarcasm. Poe – In quite a bit of the movie, but now depicted as a mutinous, trigger-happy lunkhead. No longer the selfless, hotshot pilot with awesome one-liners. Now spends most of his time questioning leadership as he’s apparently being groomed to be the next leader of the Resistance. Chewbacca – In maybe two total minutes of the movie. Does not address his dead partner at all. Supreme Leader Snoke – Killed in perhaps the most anticlimactic fashion in the history of movies. Absolutely nothing revealed about his past. We never find out who he is, where he’s from, or even if he’s Jedi, Sith, or something else. Why did I care about this guy again? Why did they put so much effort into making me care about this guy? Rey – Given virtually nothing to do as she spends most of the movie on Luke’s island being ignored. No real “heroic” moments to speak of other than moving some rocks. Has one cool lightsaber fight that proved pointless. Got to see Finn for the first time with only five minutes left in the movie. Oh, and her parents? Apparently, they were nobody. Just sold her off as a slave. They wasted so much potential with Rey’s character. So much potential. Luke Skywalker – Return Of the Jedi gave us perhaps the perfect sendoff for Luke Skywalker. He rescued his friends. He made things right with Yoda. He got closure from Obi-Wan Kenobi. He turned his father, the supposedly irredeemable Darth Vader, back to the good side. He got to see all three of his father figures reunited in peace and harmony as the Empire fell at last. If you bring him back for The Last Jedi, you damn well better outdo Return Of the Jedi. They didn’t. He spends most of his time actively trying to ignore Rey, being cranky with Rey, or being sarcastic with Rey. He does not train her as a Jedi at all beyond a philosophical lecture about the Force. However, at the end of the movie, he makes his lone stand against The First Order. Kylo Ren faces him one-on-one. We’re prepared for an epic lightsaber battle as Luke stalls so his sister and her Resistance can escape. Perhaps he’ll gain a grand death, one that will make movie-history. Or maybe he survives to team up with his sister and lead the Resistance for the next movie? Nope. He evades Kylo Ren’s attacks, and then it’s revealed he’s simply an astral projection of the Force, an illusion. He wasn’t really even there at all. The real Luke is sitting on a rock, sweating, back on his island. And after his friends escape, he falls off the rock. And then he gets back on the rock. And then he dies. So, yeah, that felt like a slap in the face. Those are just the highlights of my disappointment, by the way. I could go on and on. But I won’t. The creative minds behind The Last Jedi seemed to take into account everything we loved about A New Hope, The Empire Strikes Back, The Return Of the Jedi, and The Force Awakens, and then do the exact opposite. I don’t understand this rationale at all. I’m a sucker for the old Universal movie monsters. I love them all. When I heard Universal wanted to get into the shared universe game with their classic horror characters, I howled in delight. They’re calling it Dark Universe and plan to release new, connected films featuring the Creature from the Black Lagoon, Van Helsing, Wolf Man, Bride of Frankenstein, Frankenstein, Dracula, the Invisible Man, the Hunchback of Notre Dame, and the Phantom of the Opera. Their first outing? The Mummy, starring Tom Cruise. So here’s the thing, I saw it with three other guys, and we all liked it for various reasons. Is it the greatest movie ever made? No, not by a long shot. But, it seemed like they put a lot of effort into it, Tom Cruise delivered a likable character, the special effects were cool, the action was great, and the movie generally entertained. Yeah, there were a few plot holes. Sure, parts of it we’ve seen before. It even got a little confused at times as to whether it wanted to be a horror movie, a buddy action comedy, or a romance. And the ending, well, somehow the ending came off both clichéd and vague. But, like I said, it entertained throughout. There were all kinds of visual hints and references to the other Universal monsters, and it actually had us chuckling more than we expected. I would definitely consider it far more of an action thriller than a horror movie. Cruise had great chemistry with his wingman in the film, Jake Johnson. Tom Cruise played a man who is mostly a decent guy, but he’s also a little egocentric, a little bit of a thief, a little blockheaded, and, for quite a bit of the movie, very confused. But, Cruise pulls all of this off with his usual charm and charisma. And while there’s plenty of action, I wouldn’t call Cruise an action hero in this one. He’s more often than not the victim of action and just trying to survive. It was also a lot of fun to see Russell Crowe hamming it up as Dr. Jekyll. He will supposedly be the connecting link between all Dark Universe films, and, like Cruise, he is a generally magnetic actor. If you’re hoping for a Mr. Hyde appearance, by the way, you won’t be disappointed. Of course, the transformation didn’t make a whole lot of sense. We cracked a few jokes after the film about how he really needs to get one of the timers a lot of older folks use with their medicine, but that’s okay. Actually, that’s my mantra for The Mummy — “That’s okay.” I wasn’t expecting much, and it lived up to my expectations. Were the female roles a little bland and shallow? Yes. Did the story itself never quite come together organically? Yep. Did parts of the movie look like they had been snatched right out of other films? Absolutely. Did the ending leave us generally confused? Definitely. But, even having said all of that, we had a great time. We had fun. Fun. Let’s not disregard the importance of that word. Sometimes we want to just go see a monster movie and have some fun. That’s okay. You’ve probably seen La La Land by now, but just in case you haven’t, I’m here to tell you it’s a fun movie. It’s a great date movie. Also, there’s no denying the sheer charisma of both Emma Stone and Ryan Gosling. It’s impossible not to like them individually. Together, they are a force. But does it live up to the hype? After all, according to IMDB, it’s won 153 awards out of 218 nominations, and that’s just so far. We’ve still got the Academy Awards coming up. Well, to be honest, I don’t see what all the fuss is about. Allow me to explain before you “x” out of here with extreme prejudice. Like I said, it’s a really enjoyable movie. My wife and I had a great time seeing it together. It’s rare there is a movie playing that we are equally enthusiastic to view. Both of us, though, didn’t quite understand the rave reviews. La La Land is a modern day throwback to a bygone era. It wears its heart on its sleeve in that regard. Jazz is an extended metaphor for the movie itself, and just as Gosling’s character must realize that Jazz needs to be reinvented in order to survive, this movie seems to be trying to do the same with the musical comedy. But, here’s the thing, very little in this movie is a surprise. You’ve seen it all before, especially in the old classics that it yearns to emulate. For a movie that tries to bring to light the importance of originality, it’s awfully traditional. Here’s what really troubles me – this is a love letter to Hollywood. If La La Land wins Best Picture, I’ll argue it’s for the exact same reason Birdman won … Hollywood loves itself. There are so many references to old Hollywood in this film—visually, in the dialogue, even in the story beats. I imagine it will win Best Picture, but in the same way the coach’s kid wins MVP at the end of the season. Hollywood always votes for Hollywood. Yikes. It sounds like I didn’t like the movie, but I really did find it very engaging. Yet I can’t lie. I love Emma Stone, but her character came off as fairly cliché. We have the “damsel in distress” moment when she only decides to forge ahead after the gallant knight sacrifices himself. Her character remained inconsistent through the whole film. One minute she is a rock of fortitude, the next she’s throwing in the towel. So much of her storyline is totally dependent on Gosling’s. Gosling got a little meatier role than Stone (shocker), but even his character struck me as more “cool” than “complex.” I liked him, but some of his choices made no sense to me, especially near the end of the film. I won’t spoil it, but there was definitely a point where I asked myself, “Um … why not? Go ahead and go!” Everything he does is for Mia, until it isn’t. Or is it? Wait, what? The camera work proved really amusing, and there were moments I caught myself laughing at nothing particularly funny, just in delight at the interesting angles and viewpoints. I also loved the singing, though neither Stone nor Gosling are fantastic singers (as they are the first to admit). The dancing certainly stole the show. I loved the little moments Stone and Gosling danced together. Here’s the problem, for a musical, there wasn’t a ton of singing, and there wasn’t enough dancing. I really could have gone for a lot more singing and dancing! (I can’t believe I just typed that.) The last third of the film got quite a bit more into the drama of their relationship and the singing, dancing, and fresh camerawork faded into the background. And, as I said, that whole relationship story of theirs has been done many, many times. The last third of the film lost a lot of steam. La La Land is overrated. And before you tell me to back off, it’s just a musical, let me remind you that this movie is nominated for Best Picture against films like Fences, Hidden Figures, Lion, Moonlight, Hacksaw Ridge, Manchester By the Sea, Arrival, and Hell Or High Water. You can’t play the “just a musical” card in that kind of company with that kind of competition. Against pictures like those, La La Land seems to be a reproduction of past glory, a retread done with all the new effects. It’s good, yes, very good, but is it great? Is it the best? That sort of ambiguity irritates me. Without giving it all away, there is a brief montage of “what could have been,” and through the whole thing I thought to myself, “Wow, I much rather would have seen this as the ending.” Maybe some feel that’s the whole point, but I think that the movie had a real chance to break out on its own if it had gone down the imagined path. So much about the actual ending makes no sense to me at all in terms of characterization. So much of the ending has already been done many, many times. That alternate ending would have been a fresh resolution to a clichéd tale. Astonishingly, I do recommend La La Land. For the most part it charmed and regaled me. I’d actually recommend it even more if it wasn’t receiving all of these awards. I think I’d be less critical of it if that proved the case. As it stands, though, I just can’t get past this movie being about how wonderful and heartbreaking show business can be and Hollywood lapping it up and saying it’s the best thing this year. It all seems far too self-serving. I wanted to love this movie so much. I wanted to write a great review explaining why you have to go see Suicide Squad not this weekend, not tomorrow, but right now! I wanted to convince you why you should love this movie. But I can’t, because I not only didn’t love Suicide Squad, I’m not even sure I liked it more than just saying it’s “okay.” This may be a case of building a movie up too much in my head. Let me say this from the start: I am a die-hard DC fan. I loved Batman v Superman, and I love the direction they are taking with Justice League and Wonder Woman (which looks to be the best of them all.) I like the Marvel movies a lot, but I’m not emotionally invested in them. I’m invested in the DC movies, though. These are characters and concepts I’ve loved since childhood and I will unabashedly admit that I am totally biased when it comes to DC. I will find anything positive to say about them that I can, but in the case of Suicide Squad, a movie that I hoped would be so free of convention and expectation that it could swing for the fences, well, there’s not much. Nonetheless, I’ll try. Let’s start with why you’ll enjoy this movie. Margot Robbie stole the show as Harley Quinn. She was funny, charismatic, and interesting. Jared Leto was a Joker unlike any we’ve seen before and creepy beyond belief. I could have watched an entire movie of these two and been totally satisfied. Viola Davis had ice running through her veins as Amanda Waller, and she proved really interesting to watch as well. There were also some very cool cameos, some of which were unexpected and delighted the DC fanboy in me. Captain Boomerang didn’t say much, but his body language and facial expressions always drew my eye to him — he kept me entertained. Some things that didn’t really do it for me include hokey dialogue. I mean, at times, the characters said things that were just flat out goofy – not funny, not ironic, not inspiring, just goofy. Also, Killer Croc never quite looked right next to the rest of the crew. He was a little too “special effects” compared to the relatively homemade look of Boomerang, El Diablo, and Harley Quinn – he’d take me out of the movie every time I saw him. Croc is supposed to have a skin condition making him appear to have scaled skin, but they made this Croc literally part crocodile. I’ll admit that Deadshot was an awesome character, and when his mask was on, he was cool as could be. But every time that mask came off, I saw Will Smith. I saw Will Smith as Will Smith playing Deadshot. I can’t help it. It’s not his fault, he did a great job with the character and came through in the action scenes. I just always see Will Smith when I see Will Smith. At first glance, El Diablo seemed really complex and visually striking, but as the movie unfolds, he just becomes a cliche wrapped in a stereotype. His climatic scene made me groan a little. I feel like they really dropped the ball with him, especially because of the importance they gave him in delivering the Squad’s concept to the audience. Oh, man, it sounds like I didn’t like Suicide Squad, which is certainly not the case. I liked it, but there was just so much going on — there was actually too much going on, if I’m being honest. At times I felt like I was on overload, and that’s when I stopped caring about the movie. By the end, I really didn’t care one way or the other what happened to anyone because there was just sooooo much going on all the time! So, I won’t spoil the movie, but it goes all in on the Enchantress. I mean, magic is a major, major influence in this movie. There’s also lots of bullets. And razor boomerangs. There’s a dude who can light himself on fire. There’s another guy who specializes in ropes, which is kind of lame. There’s also the crocodile guy. Oh, and Will Smith with a cool beard and a shaved head. There’s also a great story line involving Joker and Harley Quinn which utilizes several flashbacks and depicts Joker in a way never before seen. We’ve also got the Enchantress thing, which I can’t really go into, but it ends up devouring the film, and, for me, taking it in too strange of a direction compared to what occurred previously. Truthfully, it seems like there may be no less than three movies taking place in Suicide Squad. The Joker and Harley Quinn stuff would have made a great movie all by itself. Amanda Waller putting together the Suicide Squad for a straight forward military movie could have been it’s own thing. All the magic stuff with Enchantress could have carried an entire film, just with different characters such as Dr. Fate, Deadman, John Constantine, or Zatanna. In the end, Suicide Squad tried to do too much – too many plots, too much backstory, too many blurred genres that didn’t mesh well, too much hokiness. I hate to say that because I really wanted to love this movie. Should you go see it? If you’re really into Harley Quinn or the Joker, I think it’s worth the price of the ticket. They were both so unsettling and magnetic — really fun to watch. If you just want an action movie that’s busy, fast-paced, and full of color, then I think you also will be satisfied. Otherwise, though, you’ve seen most of the best parts already in the trailer. Sherlock Holmes and Ian McKellen is surely a match made in Heaven. McKellen’s charm is on full display as he plays one of literature’s greatest analytical thinkers. He perfectly captures Holmes’ wit, his intellect, his brazenness, and even his repressed guilt. There is a catch in this version, however. Holmes is 93 and suffering from memory loss. He wants to set the record straight about his real persona and is therefore striving to write his account of events in opposition to Watson’s, but he simply can’t recall all the facts. For a man like Holmes, this is torture. Now living in the countryside and tending bees, Holmes relies on his housekeeper and her young precocious son to run the property. Three plots ensue – Holmes desperately trying to recount his last case, one that drove him into seclusion. Another is a mysterious plant he needs to restore his powers of recollection and the man providing it. Still another involves the young boy living on his property, and the unlikely bond they develop. This film is very much a character driven piece. The main character is 93, so it never moves very quickly, but don’t let that fool you. McKellen brilliantly depicts a man accustomed to outsmarting every challenge imaginable, and the horror behind his eyes is potent as he realizes this is one feat he can’t overcome. The climax is an engaging one – there are no big action scenes. But that moment, the moment a man disconnected from a world he very much intellectually dominated finally joins it on an emotional level – McKellen will leave a lasting impression, I assure you. Though the movie is subdued and quiet, the scenery is beautiful, the acting is superb, the characterization is fascinating, the mystery is legitimate, and the story is ultimately satisfying. I’ve got to be honest, I think Ant-Man may have more heart than any other Marvel movie to date. It touts itself as a heist movie, and it is, but this movie is mostly about fathers and daughters. You’ve all seen the trailers by now – Scott Lang is recruited by Hank Pym to be the new Ant-Man. Lang is a recently released master burglar, and he wants nothing more than to reconnect with his young daughter. Hank Pym has a daughter, Hope, in her mid-thirties, who wants to don the Ant-Man suit, but Pym can’t bring himself to put her in harm’s way due to a tragedy in the past. With Hank’s secret Pym Particles about to be outed, both men must look deep within to save the world from chaos. Ant-Man found a perfect balance of comedy and action. I wouldn’t call it a comedy, yet I found myself chuckling, even laughing, throughout. There is action galore, and the special effects are mesmerizing, especially when Ant-Man enters the world of miniature. Yet, for me, the best parts of the movie arrived when Michael Douglas (Pym) finally revealed the fate of Evangeline Lilly’s (Hope) mother. Also, every time Paul Rudd (Lang) interacted with this daughter, it just brought a smile to my face. These well-acted, subtle, emotionally authentic moments don’t happen often in Marvel movies, and they were played perfectly. Rudd is that kind of actor who can make any character likable, so I thought he was perfect for Scott Lang. And Michael Douglas, man, I forgot what a great actor he is. There’s no doubt that this would not have been the same movie without him. He definitely brought a gravitas to Hank Pym that was very much needed. Don’t get me wrong, he had some great one-liners as well! Lilly also found the sweet spot of her dynamic with both Douglas and Rudd. These three brought real emotional depth and fun to a movie that could have become all spectacle. I won’t spoil anything, but I’m particularly excited to see where Lilly goes in the Marvel movie universe from here. And Lang’s crew, led by Michael Pena, killed it. Pena was an absolute riot. He stole every scene he entered. He’s been getting a lot of accolades for his acting in this movie, and he deserves all of it. Truthfully, when I heard they were making Ant-Man, I cringed. But then I heard Edgar Wright would direct, and I saw infinite possibilities. But then Wright left, and I, like everyone else, figured Ant-Man would sink. I’m here to tell you, director Peyton Reed took the existing script and nailed it. This movie exceeded my expectations in every way. 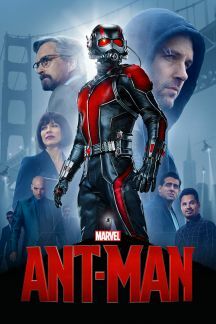 Because of the fun, the father-daughter dynamics, the comedy, the special effects, the action, and the acting, I have to consider Ant-Man one of my favorite Marvel movies thus far.